Boyfriend jeans are all you need for a cozy Friday. Currently shooting some bridal magic with my wedding photographer, Alison Conklin, all over LA today. Stay tuned and be sure to follow on instagram and snapchat (user: eatsleepwear) for behind the scenes magic. JLu - This look has a great boho vibe to it! Love the hat and the long hair. Lovely blog! Jeanne - Love your studded sandals with the ripped jeans! Ashlee - These jeans are perfect! Natali - Simple, masculine but such a stylish outfit! You look beautiful! 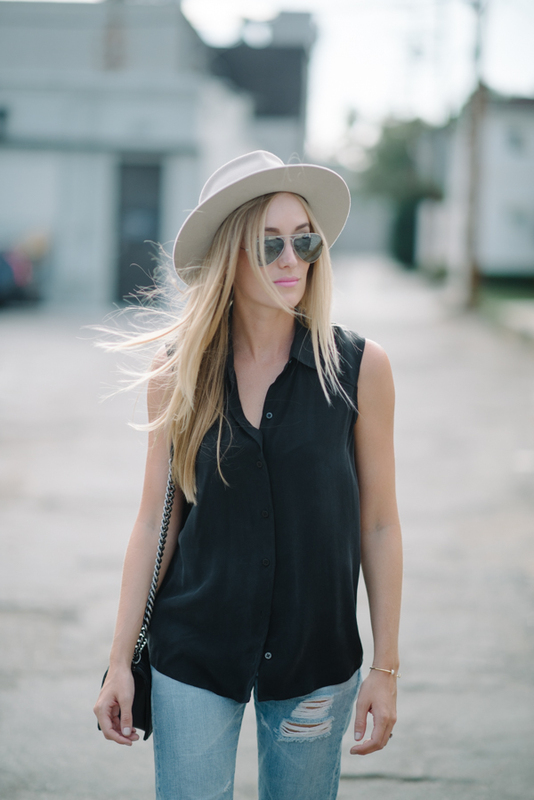 Camille Freestone - Love love love the simple edginess of this look! A pair of distressed jeans makes everything better! Emily - I love this look, can’t wait for summer. Missing my summer outfits. nikki - i love those sandals! Coco - Love the bag! Michelle Lee - such a great look! jdhartil - Such a lovely cool casual look!